Austria (German: Österreich; officially called Republic of Austria), is a country in Central Europe. Around Austria there are the countries of Germany, Czech Republic, Slovakia, Hungary, Slovenia, Italy, Switzerland, and Liechtenstein. Currently, the chancellor is Sebastian Kurz. The previous chancellor was Christian Kern (2016 - 2017). Austria has been a member-state of the United Nations since 1955 the European Union since 1995 and OPEC since 2019. 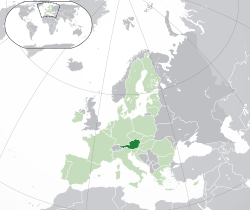 The people in Austria speak German, a few also speak Hungarian, Slovenian and Croatian. The capital of Austria is Vienna (Wien). Austria is more than a thousand years old. Its history can be followed to the ninth century. At that time the first people moved to the land now known as Austria. The name "Ostarrichi" is first written in an official document from 996. Since then this word has developed into the Modern German word Österreich, which literally means "East Empire." Austria is a democratic republic. It is a neutral state, that means it does not take part in wars with other countries. It has been in the United Nations since 1955 and in the European Union since 1995. More information: States of Austria. The federal government has been consisting of the ÖVP and the FPÖ parties since December 18, 2017. Chancellor is Sebastian Kurz (ÖVP). Austria was the Austrian Empire from about 800 to 1867 and was ruled by The House of Habsburg for most of that period. Between 1867 and 1918 it was a part of Austria-Hungary. Then it became a republic. The First Republic was from 1918 to 1938. From 1938 to 1945 Austria was part of Nazi Germany. The Second Republic was started in 1945. Famous Austrian dishes are Wiener Schnitzel, Apfelstrudel, Schweinsbraten, Kaiserschmarren, Knödel, Sachertorte and Tafelspitz. But you can also find a lot of local dishes like Kärntner Reindling (a kind of cake), Kärntner Nudeln (also called "Kärntner Kasnudeln", you may write it "...nudln" too), Tiroler Knödl (may be written "...knödel"; ), Tiroler Schlipfkrapfen (another kind of "Kärntner Nudeln"), Salzburger Nockerl (also may be written ..."Nockerln"), Steirisches Wurzelfleisch (..."Wurzlfleisch") or Sterz ("Steirischer Sterz"). ↑ "Population by Year-/Quarter-beginning". 1 October 2015. ↑ 3.0 3.1 3.2 3.3 "Austria". International Monetary Fund. ↑ "Human Development Report 2015" (PDF). United Nations. 2015. Retrieved 14 December 2015. ↑ Sebastian Kurz gets approval for coalition with Austrian far right. Politico. 17 December 2017. This page was last changed on 4 April 2019, at 04:28.